I've been a fan of the show since episode one and we're now to episode 600. It's been hundreds of hours of fun, a couple dozen hours of fascination, half a handful of hours of rational rage, and a couple hours of sadness. All worthwhile. This thought provoking podcast fills in the topics covered with clever humor. Never know if e is going to zig or zag. By Why is that growing there? Geo has a great show. It is always entertaining and sometimes very informative from historical facts to interesting animals in the world. He also gives some advice about clothes, and also just some general tips about getting through various situations in life. Would recommend and it helps to get me through a work day. I started listening four years ago after I heard George on the Skeptics Guide to the Universe. I can now say that I have listened to every episode and purchased two albums. George is hilarious, insightful, and inspirational. I am glad to have found it! I love this podcast. Geo is smart and funny. I love when George plays his music. I especially like the weekly standards. Keep up the good work! If you like music, science, skepticism, and humor; this is your show. After a few listens, George will become infectious. He often gives a great angle on things and comes up with items of interest that you won't hear anywhere else. Brilliant podcast! Really enjoy listening to it while at work, keep up the great work! Highly recommended! If only the host practiced what he "preached"
How does George Hrab set the standard? By opening up and sharing his life. The humor is not from weird things around us. It's from George's ability to take a second look at what normally passes us by. And some weird things. There are weird things, too. I like George on the SGU so I gave his podcast a try after it was mentioned on that podcast. It was not what I expected (there is no science content). If you like jokey, jokey schtick like you'd get from a small market shock jock then this is for you. One of the funniest, smart podcasts around!! Funny, witty, smart, clever, great personality, great unique original songs... a 50-minute blast every week. Jumped to my favorite podcast (of many to which I subscribe) in mere weeks. Brilliant stuff... My main "listen to first" podcast every week. I am so impressed with George Hrab and his podcast! I heard Geo on a back episode of Cognitive Dissonance and enjoyed his guest appearance, so I decided to check out his podcast and I'm so glad I did. I was immediately hooked by his music and humor and the topics for the podcast. Geo's little updates at the beginning about his life and his band are interesting. Through those and his opinions on the show's topics it seems like Geo is a truly nice human being too. The variety of goofy voices and his appreciation for the band Rush are pluses too! My favorite quote to date (I haven't watched all the episodes before Dec 2015 yet though): "...from the pages of "DUH!" Magazine..."
George is the best "rambler" out there. Great personality, great show. Thank you!!! A fun listen every week full of great info and topics to make you think. This is a fun and thought provoking podcast at the same time. I never miss an episode. This is a well developed variety show that has a mixture of music, skits, news, reviews, comedy, and everything but the kitchen sink. George is a genuine nice guy and his talents would be great for a radio or television program. That said, his older shows contained innovative ideas and a lot more skits which are rare in modern episodes and I do miss them. Like hanging out with a funny, intelligent friend! This is one of my favorite podcasts! George is talented in so many ways, and he throws himself into this podcast all the way. He muses about everyday things, then hits you with the "religious moron of the week," talks in depth about music he loves (and doesn't love), gets into serious subjects, and keeps on surprising the listener. Extremely well produced and very very funny. Nothing to do with geology... and that's a good thing. It's good that George did that. :-) Always great stuff. George Hrab never disappoints! Always funny. Always amazing sound. Always well mixed. This is one of my favorite shows. Witty, insightful, thought-provoking and sometimes deeply personal. Geo makes you feel like he's one of your best buds. I enjoy this podcast because of the high production value and the intense amount of effort George puts in to all his voices and such. My favorite segments are the Religious Moron of the Week and George's rants. He also discusses the music world, particularly drumming advice. And the life of a skeptic. Hey Geo.... Long time listener, first time reviewer! Just wanted to tell you how much I deeply enjoy listening to your show. Ms. Info is awesome. I wanted to tell you how MUCH listening to your pod cast #225 changed my life. I no longer take my family and friends for granted. (or at least try not to)Thank you for sharing the life of such an awesome person with the community and the way you honor him encourages me to be a better person. This was a powerful episode. Thank you. ps, I enjoy the rest of you shows as well. Oh, yeah, the music is soooo much fun! There are so many things to love about this guy. He's effortlessly interesting and informative, extremely talented (at least, more so than I, musically--and in most other measurable ways as well), and, best of all, acutely entertaining. Big thumbs up! Love this show, even with all Geo's ranting, he's still hilarious. It's like Monty Python done by one guy. Brilliant. One of the best podcasts out there; I've been a fan for years and it's always fresh, fun, and thought provoking. Nobody does it like George. So brainy and brilliant, he will wear the Goofy Cap to try to keep us from knowing how far ahead of the rest of us he is. In an across the spectrum Talent and IQ race among today's "skeptical mavens", my money is on George. One wonders if he is not made for a larger podium from which his combination of sly, wry and ridiculous banter and insight can reach more people. You go, Geo. It doesn't matter the subject, George is always entertaining. He is a funny and insightful guy that will have you laughing the whole time. One if the best produced shows out there. "Funny and intelligent..." says this reviewer. George is a brilliant man. He delivers entertainment, logic, and skepticism with a humorous bent. I have been a subscriber since about episode 43 and onece i signed on i went back and listened to them all. I find myself laughing out loud at least once an episode. Even when the subject gets serious its always riviting. I consider George a friend that vists once a week. A very well regarded friend. Here's the deal. It's not necessarily about geology. If you're already a fan of George, you'll love it. Others might find this podcast a little annoying. Some may lose interest as he rambles. I love his ramblings. If you're not a fan but are a music geek, science geek and have quirky sense of humor, you may find him charming. It's mostly George talking about things as most shows don't have guests. I recommend this podcast but it's not necessarily for everyone who is a skeptic or interested in science. This is the best podcast of any format. High production values without an attitude issue with the host... unheard of. Thought provoking and funny. George is a great asset to skepticism. 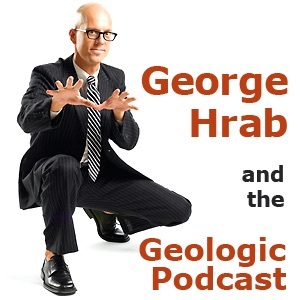 I started listening to the Geologic podcast a year or so ago -- possibly longer. I started listening after the Skeptics Guide to the Universe posted one of their TAM interviews with George Hrab. I know he has been interviewed several times, and I'm not sure which one was the one that intrigued me. I was entertained with the interview, and so checked out this podcast. Each podcast must take tons of work. These are true pieces of theatre. This is a very funny, well-put together podcast. It is a single actor with many voices. The podcast is heavy-handed with the atheism. I know some skeptics who are unable to listen because they aren't atheists and find it a little strong for their tastes. However, I recommend at least giving the podcast a try if you consider yourself either or both a skeptic or and atheist. The podcast for fans of critical thinking with a sense of humor. This is the first place I stop every week for a dose of critical thinking and hilarity. I found the Geologic Podcast by accident, but it has quickly become one of my favorites to listen to each week. From the funny (Religious Morons, Mortimer), to the science (interesting fauna), to the music (clips of his CDs, PFA) to the serious (talking about ways to live life as a non-beliver) Geo keeps it interesting and entertaining. It is a must in my weekly schedule. And to top it off, Geo has quickly become one of my favorite singer/song writers (which I realized I used that phrase twice in this review, but...). I highly recommend this podcast to anyone with a witty sense of humor, a skeptical eye, and a general love of all thing Zappa. Vibraphone! This is one of the best podcasts anywhere. George is smart, fun, and doesn't take himself too seriously. If you are interested in science, skepticism, critical thinking, music, or humor; do your self a favor and subscribe. Geo is funny, engaging, uninhibited and smart. He is so personable that his listeners feel more like friends than fans. I also learn a lot about music from the show - enough to know what questions to ask my son, who is also a musician. Vibraphone Geo! Never fails to amuse and delight! I've been listening to Geo for the past 120 episodes. He has great insight and quite the musician. (Listen to #170 for a free listen to his latest relaese Trebuchet - you can hear the Zappa influence). Geo - keep it up and VIBRASLAPONTHEBACK my friend! His wonderfully humorous podcasts can transform an ordinary day into one filled with mirth and amusement. Well, at least if not fully filled the hour or so it feeds into my brain via my iPod. Absolutely one of my very favorite podcasts Had to add more comments. I think George Hrab is truly talented. He can write music, do stand up, sing, and tell stories as well as discuss almost any subject in the most interesting manner. Hope to someday see him perform in person. Priceless! Hrab is a gem! Funny, thought provoking, vibraphonic! George Hrab is Monty Python, Kurt Vonnegut, Carl Sagan, and Sting rolled into one priceless podcast. A must! This show is absolutely amazing. Most of all, I enjoy George's advice when very serious questions are presented to him in the "Ask George" segment; questions that many people in this world dont even think about. Its good to hear a voice coming over the speakers that I can identify with. Thanks for everything you do George. Not my thing, but it may be yours, so don't let my comment stop you from checking it out. I'm happy that George Hrab is a skeptic and an artist. The world needs more like him. He opens doors to the non-science and non-geologic parts of the world and invites them in to check out our skeptical wares. In that sense, he makes the world a better place. As for the podcast...well, like I said, it's not my cup of tea, not my slice of cake, not my...not my...not my brand of cookie. It's not chocolate chip. It's not an Oreo. Well...maybe a few of the podcasts are like an Oreo though without the creamy filling and let's face it, that just ain't an Oreo. Unless you happen to like Oreos without the creamy filling in which case you're just eating two chocolaty crackers. A virginal Oreo, if you will, if I may. And come to think of it, are they really chocolaty, those Oreo crackers that bookend the goodness? No no no. I've had chocolate...I mean real chocolate. The kind made by little Swiss girls in pony tails. When it comes down to it, these Oreo...um...endpieces (what else do you call them? Cookie discs?) taste more like the residue at the bottom of a nuclear reactor’s pressure vessel with caffeine additives. Just really really really disgusting. Unless you dunk them in milk. Now that’s what I call good eat’n! No…this podcast is, for me, more like a Lorna Doone. Or a Ritz. I Get It. NOT about Geology.